Growing in popularity, destination weddings offer couples the chance to celebrate with friends and family while allowing the bride and groom to escape the hassles of planning a traditional wedding. Consider California when choosing a location for a destination wedding: California provides a variety of landscapes and year-round destinations. According to the Lake Tahoe Wedding & Honeymoon Association, Kodak called Lake Tahoe one of the most photographed places on the planet. Imagine a wedding ceremony by the cobalt-blue waters surrounded by the Sierra Mountains. Offering over 300 days of sunshine year-round, Lake Tahoe provides breathtaking wedding locations in both the summer and winter. Consider The Wedding Chapel at Harveys or Chapel of the Bells for a more traditional ceremony. Capture the beauty of Lake Tahoe with an outdoor ceremony at Emerald Bay aboard a boat or on Regan beach West. Get swept away to another country without leaving the United States. Located about 22 miles off the southwest coast of California, Catalina offers a Mediterranean-style setting. 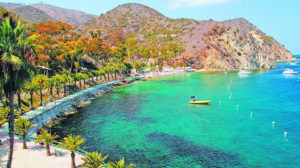 Access the island via the Catalina Express, which leaves from the Long Beach port several times daily (purchase tickets in advance, as they often sell out for the hourlong boat ride). Choose from beach-side settings, ballrooms, secluded coves or banquet rooms in restaurants. Check the Catalina Chamber of Commerce Web site for wedding planners, wedding packages and other services. Plan your nuptials in California wine country. While Napa and Sonoma may come immediately to mind, consider other destinations such as Monterey, Santa Barbara and Paso Robles. Planning ahead for a destination wedding at a winery or vineyard is essential because they do book up quickly, especially during the summer and harvest. Serving the products from the winery at your destination wedding are a given, but inquire about catering services and other beverages. Wineries and vineyards provide not only picture-perfect scenes but the convenience of the same location for both the ceremony and reception.